With the numerous Chinese restaurants in Singapore specializing in different types of Chinese cuisines, one such familiar name is Peony Jade who is known for its Szechuan/Cantonese cuisines. 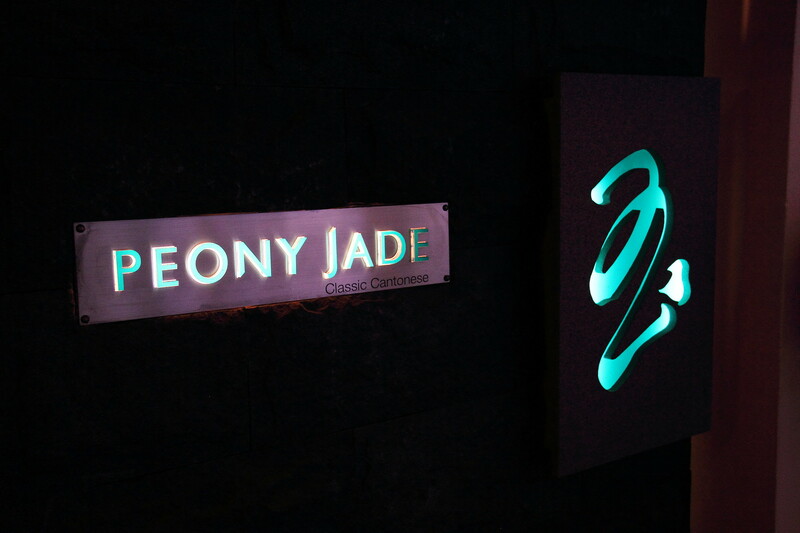 Peony Jade currently has two outlets, one at Clark Quay with the other at Keppel Club which is opened to public. At this time of the year, it is the season for the much awaited Hairy Crabs from Yang Cheng Lake in China's Jiangsu province. Peony Jade has created The Gold Rush Hairy Crab Menu available from 14 October to 30 November 2014 to celebrate the return of these delicious crustaceans. Welcoming the return of the delicacy, we started with the Mister Crab ($14.80 for 3pc). 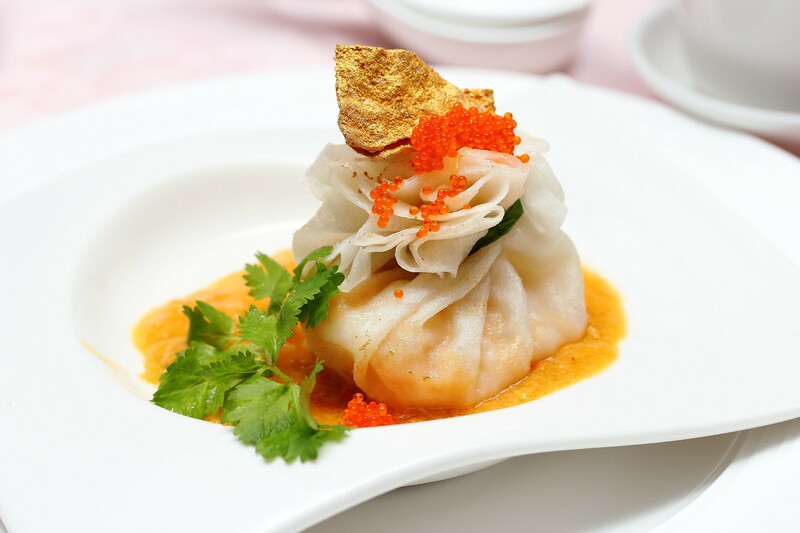 The cute crab shape crystal dumpling is filled with prawn and hairy crab meat. 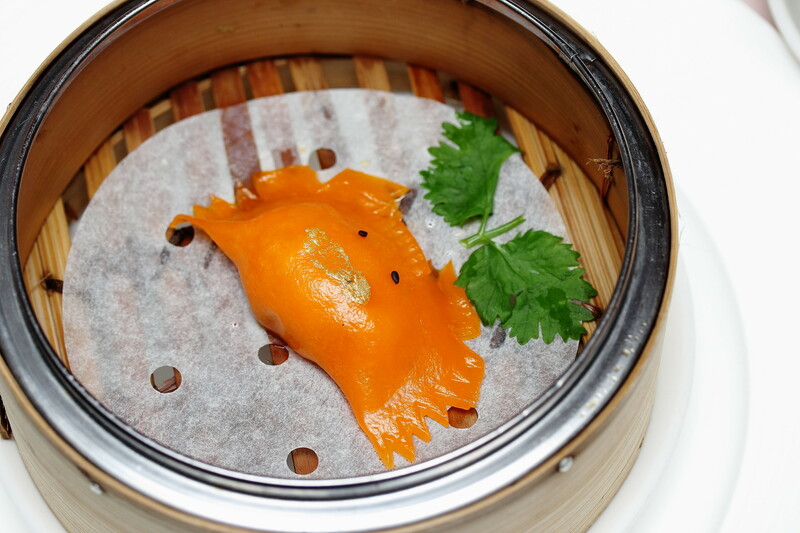 Packed inside the thin translucent orange dumpling skin is a delightful marriage of crunchy prawns and buttery crab roe. Next is the Pomegranate Hairy Crab Meat topped with Creamy Golden Roe ($58). This is a hit and miss for me. In terms of the ingredients and flavours it was top notch that was very pleasing to the palate. This is like discovering a bag of gold with all the luxurious ingredients wrapped in the huge dumpling skin. Unfortunately due to its huge size, I have difficulty figuring how best to consume it. In the end, I am left with the tail end of the dumpling skin which was not very palatable. 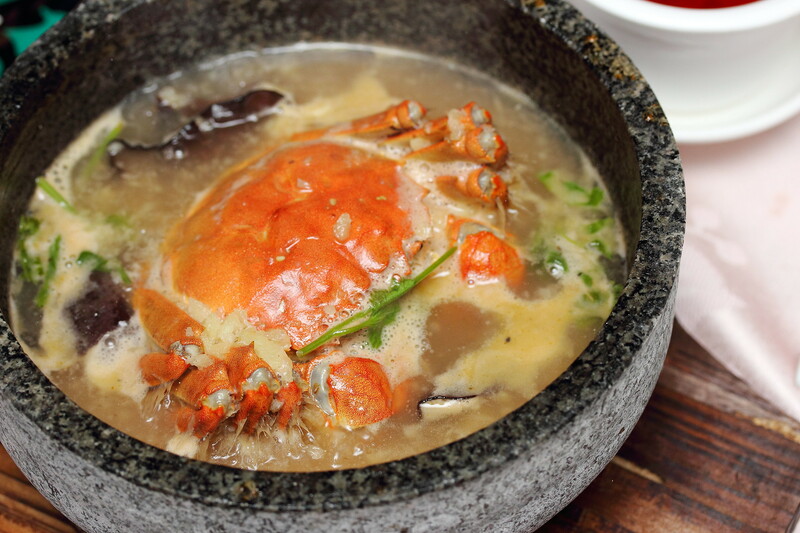 The Steamed Hairy Crab with Homemade Chinese Rice Wine ($48) which is cooked in a stone pot is an unique take from the tradition way of preparing the hairy crab. I applauded the idea of having both the Ying and Yang elements in a pot. Hairy crab is known for its Ying element and usually is paired with Chinese yellow wine or ginger tea to balance with the Yang element. In this dish, the Chinese rice wine which is fermented by the Chef himself for more than a month plays the role of the Yang element which is slurping good. Unless you have an iron fist, the challenge will be dissecting this little fellow cooked in a pipping pot of soup. Like all Chinese dinner, our last course is a carb dish in the La Mian Soup Topped with Hairy Crab Meat Garnised with Golden Caviar. 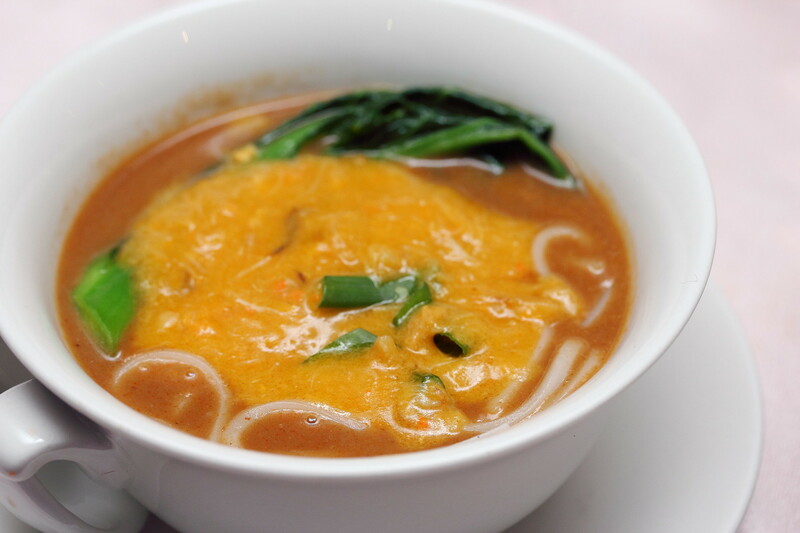 The full bodied soup with the buttery golden hairy crab roe was simply richness in a bowl. However the intense flavour can be too heavy for some but definitely not me. The hairy crab feast is wrapped up on a ginger high with the Boiled Hot Ginger Tea with Glutinous Rice Dumplings ($7). The ginger was really spicy which is good for the body after consuming all the hairy crabs dishes. 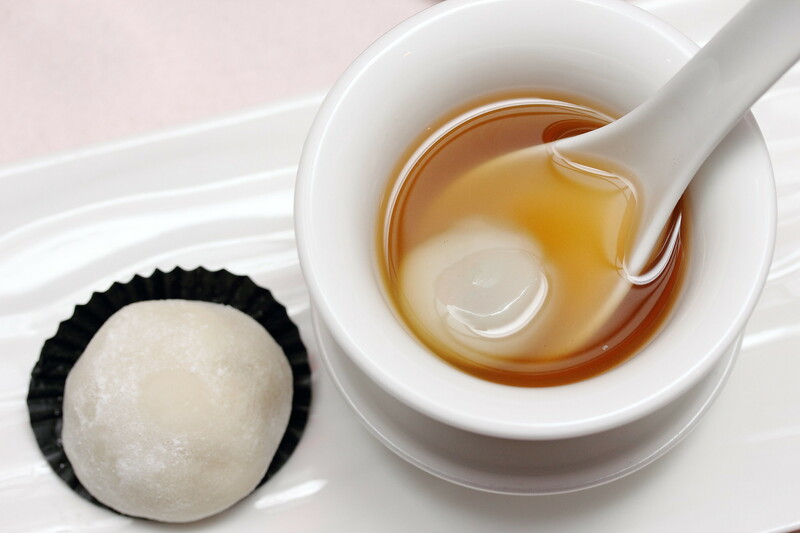 This ends on a perfect note with the Mao Shan Wang Durian Mochi ($12 for 3pc). I have only known of their Mao Shan Wang mooncake but the mochi with its soft chewy texture stuffed with the creamy and fragrant premium durian paste brought the house down for me. This seasonal hairy crab promotion at Peony Jade at Keppel Club is available from 14 October to 30 November 2014. Prices start from S$12 for ala carte items, S$88 per person for set menu and S$138 per person for premium set menu.